If you’ve been looking for a way to convince your company’s IT department into picking up some iPhones and iPads, media and security software maker Equinux just added a big new bullet point to your list. 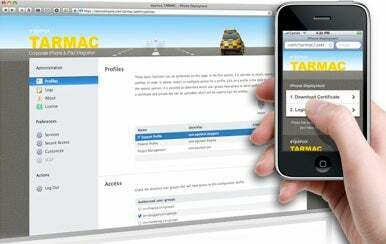 On Tuesday, the company released Tarmac, its medium-to-large enterprise-provisioning system for iPad and iPhone. Tarmac is a network tool that is specifically tailored for secure, over-the-air (OTA) provisioning of the iPad and iPhone. In fact, Equinux boasts that it’s “the first professional provisioning tool for the Apple platform.” Tarmac supports a number of existing directory services and databases like Active Directory, Open LDAP, and MySQL. It also supports Microsoft Exchange, hardware and software restrictions (such as limiting Safari to trusted content or disabling an iPhone's camera), L2TP/PPTP or IPSec-based Cisco VPNs, encrypted communication via SSL/TLS, remotely wiping devices, and even Web Clips to give employees easy access to internal resources or external sites. Tarmac uses trusted certificates to secure communications and admins can specify their own Certificate Authority. It also supports user groups for specifying resource permissions to different departments, and users need only to log into Tarmac Server on their devices to begin the authentication and OTA configuration process. Installing Tarmac requires an Intel-based Mac running Mac OS X 10.5 or newer. Administrators and consultants are encouraged to register at Equinux’s Website for the demo, which is coming soon. Interested customers should contact Equinux with company needs and pricing questions.